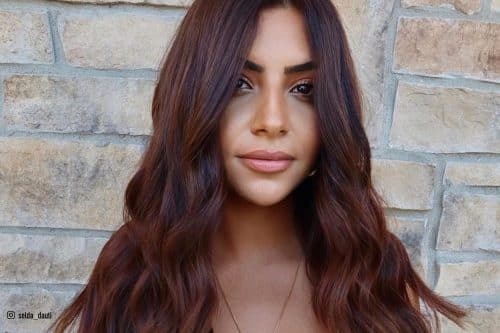 To get the most out of your black hair with highlights added, getting the right amount of contrast against your raven mane that can flawlessly complement your complexion is the key factor. 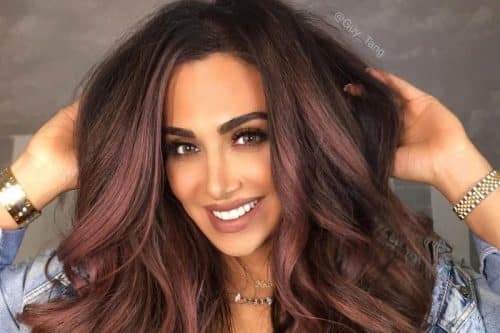 Dark hair makes your face color more prominent and adding the right color of highlights makes a huge difference on the overall style. That’s right – your skin tone plays a big role in rocking a black hair color. Neutral and fare skin colors go best with warm highlights such as golds and reds. Darker complexions, on the other hand, blend excellently with both cool and warm tones. 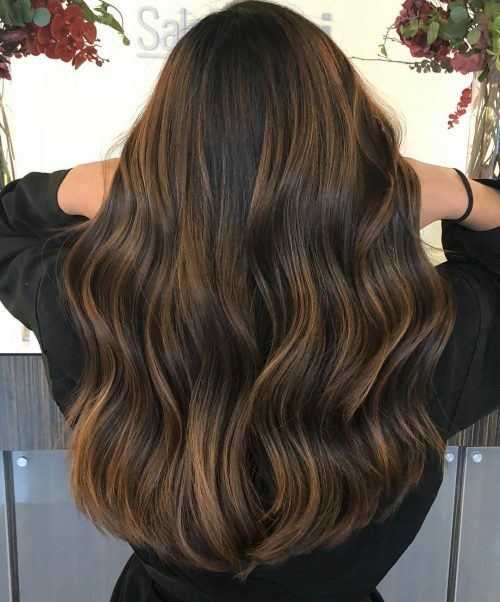 If you’re going for a more natural look, ribbons of deep brown and darker shades can create a voluminous and dimensional appearance, especially when styled with waves and layers. 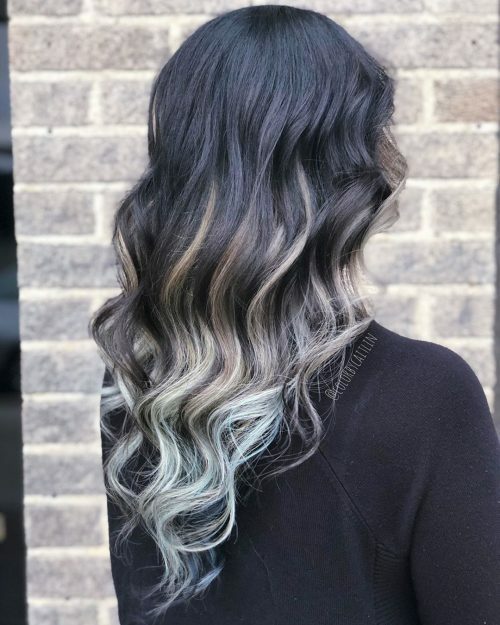 You also need to take note that a true saturated black base will always have a stark contrast even if the highlights are soft and subtle, making this dye job really achievable and a super easy process! There’s no need to think too much about ways on how to spice up your silky jet black hair! 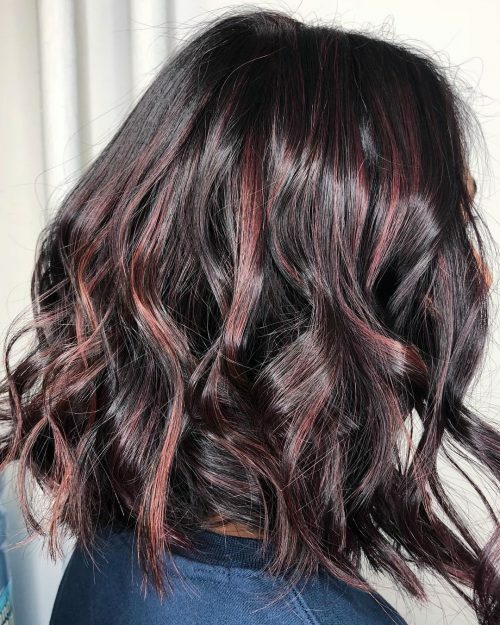 Below, you’ll find the most recent looks of gorgeous black hair with highlights that are so in right now! Straight seems so spiritless? Look out for pastel pink for a more popular presence. We’re obsessed with this stunning ash-beige tone! 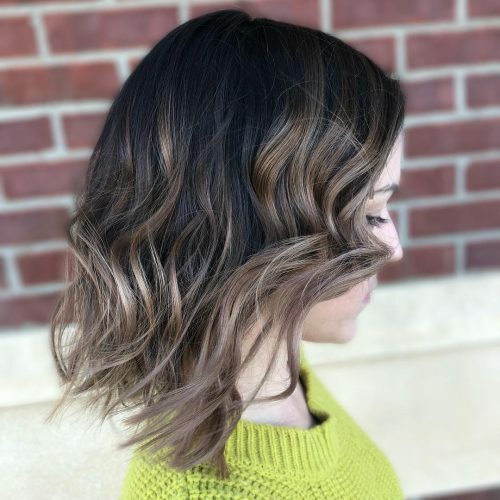 Stylist Amanda tips that it is so much easier to go lighter from dark when it’s natural hair as opposed to artificial dark color. 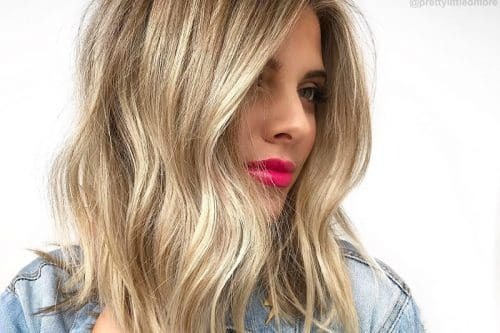 Highlightened locks create incredible movement that is sure to be eye-catching. 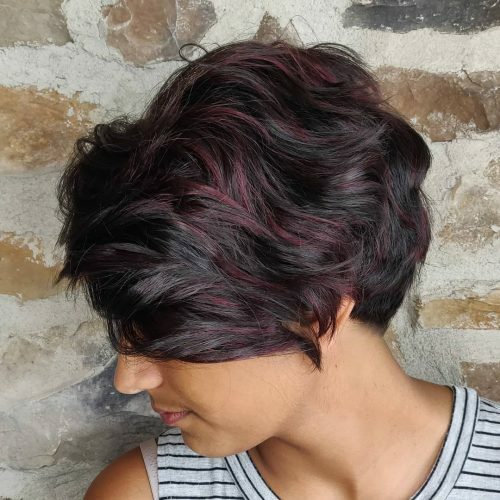 Go full rocker with this modern cut! Get the benefit of less hair care plus added movement and texture to your short style. These rose accents are here to give you a little warmth for the holidays! That abundant texture comes with low-maintenance styling, ideal for a busy schedule. Give life to your waves with this lustrous snowy blend! If you’re hair isn’t already blonde, getting ashy blonde is always a multi-session process but definitely worth the patience! 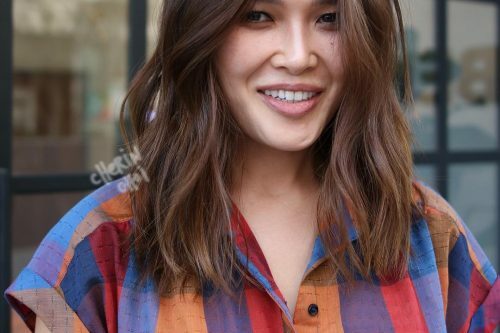 This choppy lob looks very flattering on petite faces. 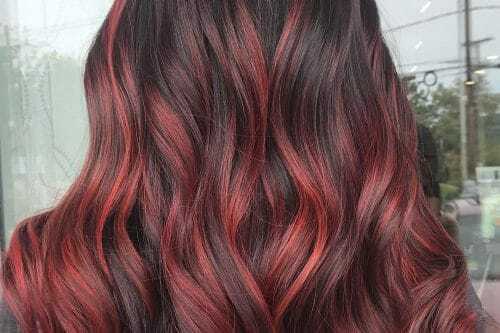 The contrasting hues create a marvelous effect on layered hair without sacrificing volume and style. 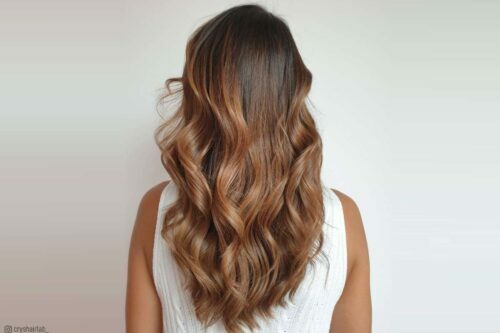 Beach waves on a brunette are perfectly complemented with warmer accents. The ash streaks show off the hair’s movement and texture. A dark hair with ashy tones brings out a high level of contrast that can accentuate every twist and curl amazingly. Get ready to take in some good vibes as compliments roll in! 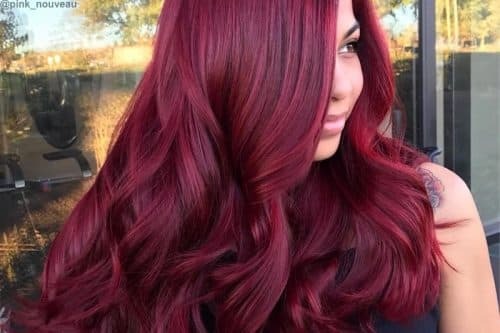 This hairstyle is all about the curls and women with naturally curly hair can definitely take advantage of the color combination. 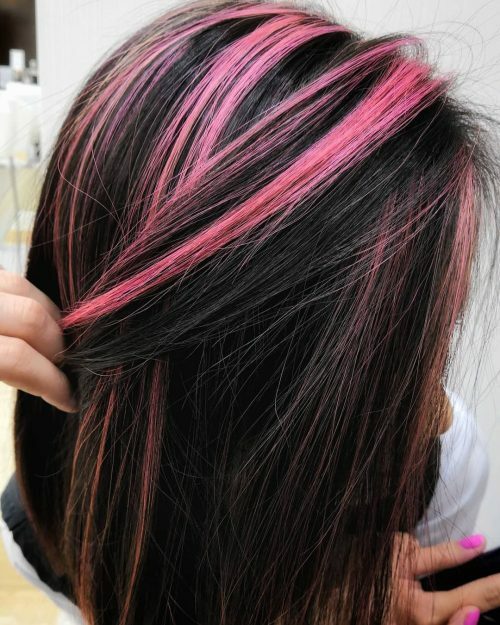 This is a black base color on a medium long bob with flashy pinky highlights. I did the base color a week before, then I took several hair strands and bleached them. The bleaching part took 2 hours because of the very dark base. Once the highlights were light blonde, I rinsed the hair and applied the pink color. The result was really incredible! I think that this look is better for a young confident woman or girl with a great personality that has a dynamic lifestyle. Usually, these types of colors are perfect for those who go for parties and events. 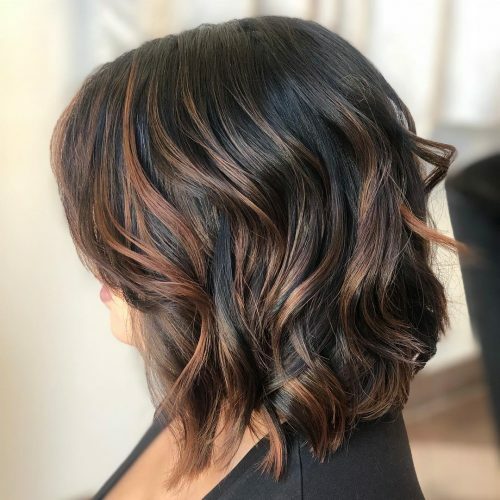 This style suits women with a nice bob cut or a graduated bob cut (the one shorter in the back and longer in the front). Also, nice facial features help enhance the color even more, and it’s preferable on light skin. 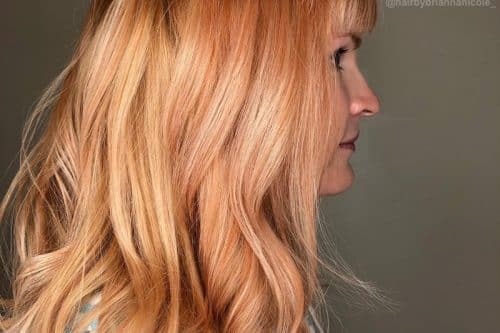 For this look I used a balayage technique, enhancing this natural brunette color with a beautiful rose gold tone. 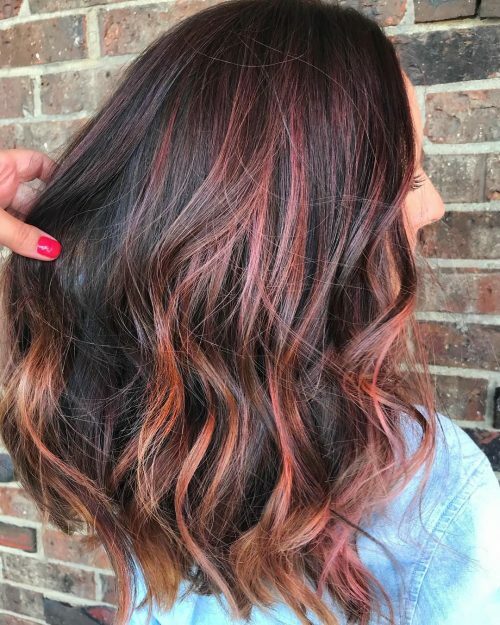 Rose gold has become a very popular red shade that combines well with many base colors. This color is great for adding dimension to any brunette with any length of hair. Rose gold is a fashion tone, so it tends to fade fast. A professional color care shampoo is recommended. Also, a pigmented conditioner, i.e, Celebluxury rose gold conditioner would be very helpful in keeping the tone. 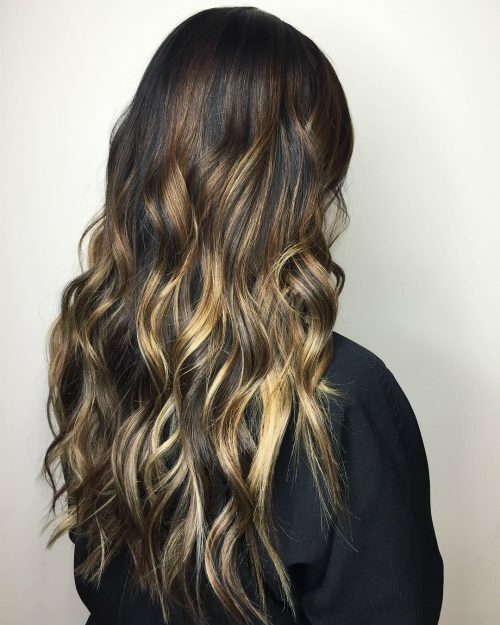 This balayage is rich and dimensional while still looking natural. The highlights complement her skin tone and natural hair color. She has a long layered cut for some lightweight movement and soft angles to frame her face. 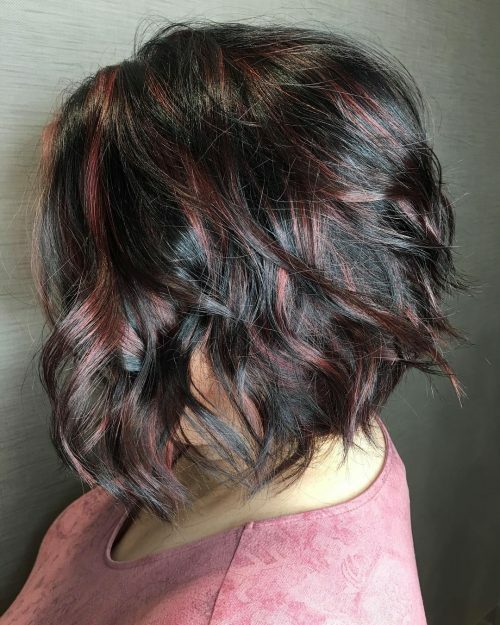 This is a lower maintenance look for a client who only colors 2-3 times a year. 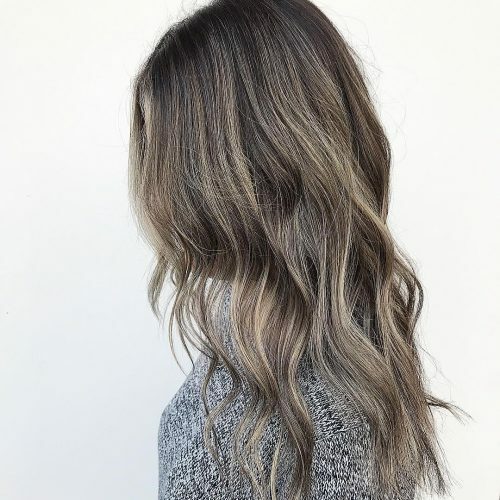 Balayage is perfect for the on-the-go girl, and the grow out is super soft and leaves no harsh lines or roots to be touched up. I would highly recommend using professional shampoo and conditioner for color longevity. 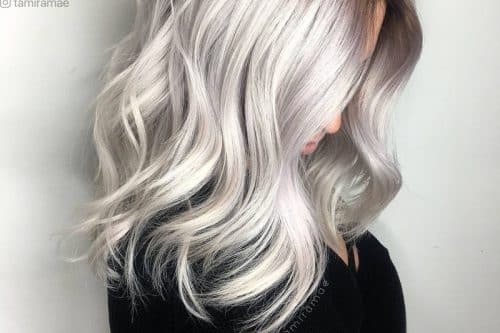 Over time highlights can turn brassy, so incorporating a purple or blue toned shampoo into your routine will keep your highlights fresh and true to tone. 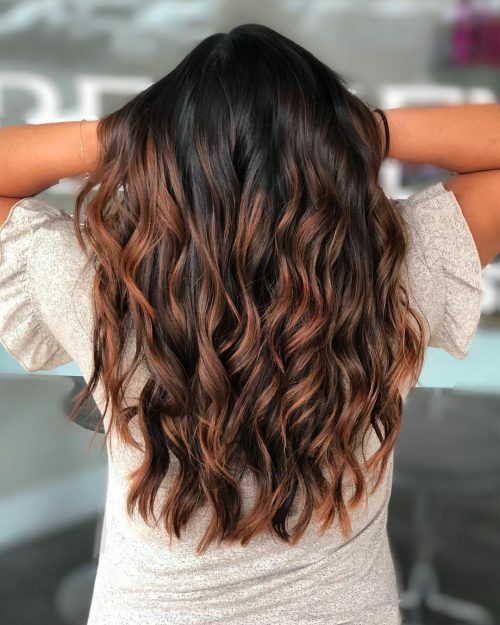 These styles are complemented by loose waves, and using a heat protectant before blow drying/heat styling will keep your hair happy and healthy! This look is a high contrast foilayage with rich chocolate, caramel, and vanilla shades. I love the rich dark chocolate root because it gives a beautiful backdrop for the lighter colors. The waves also help to bring out the contrast. Styling is a huge thing when it comes to these high contrast looks. With straight hair, there is more brightness and less dimension. 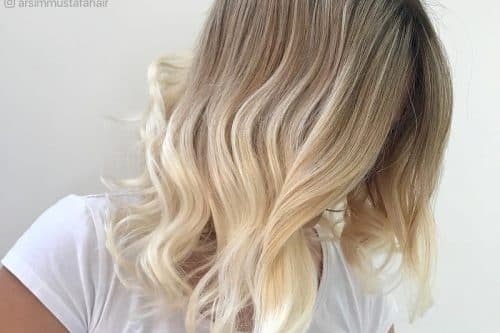 When waved, it adds more contour to the color, adding more “pops” of blonde. The cut is done dry with a mixture of blunt cutting and point cutting. I used a 1 1/4 inch hot tool marcel to create this look. However, my client uses her Beachwaver Pro to create this look with less effort and easy styling. It’s low maintenance as long as you’re not covering grey. Most of my guests come 3 times a year with a color like this. I would say it’s great for someone who wants a lived-in and more natural color but also wants to be noticed. As far as face shape, that’s where the artistry comes in. Placement is key in order to bring out or minimize different features. 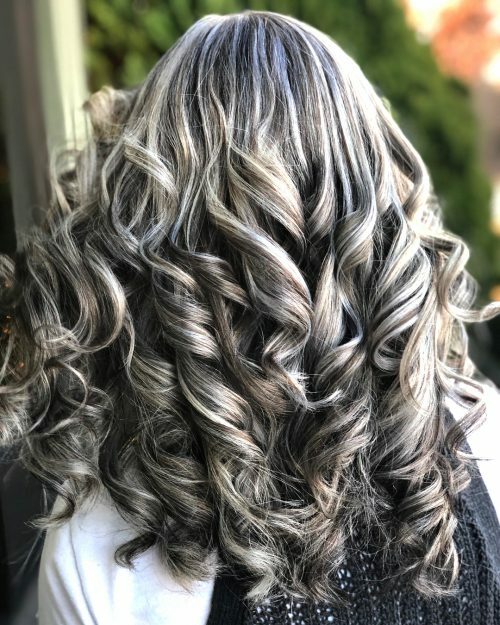 It’s awesome platinum highlights that match perfectly with her natural black hair. 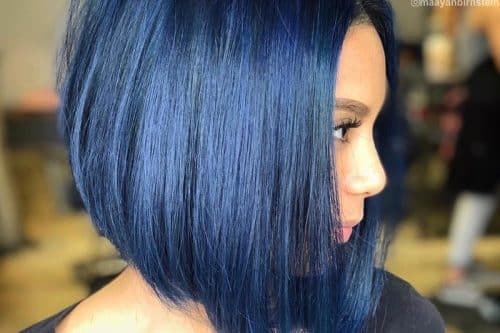 I’m truly passionate about delivering a custom color and hairstyle that is perfect for each client’s lifestyle, considering her height, her personality, and her type of job. 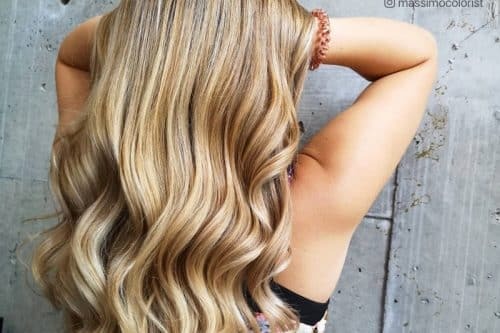 The highlights are chosen as a point to value her hair and face. For the haircut, she loves to keep her hair long at the back. It is an individual process, but the most important thing is to feel comfortable and confident with the professional who will be doing it. More important than the color is how you’ll be taking care of your hair at home. Follow exactly what your hair colorist will tell you on how to manage platinum hair. Keep your hair trimmed every 4 months. It will give you the best healthy hair that you already have. This haircut is a disconnected pixie. The back and sides are cut quite short, and the horseshoe section on the top is longer, giving the cut versatility to wear on either side. 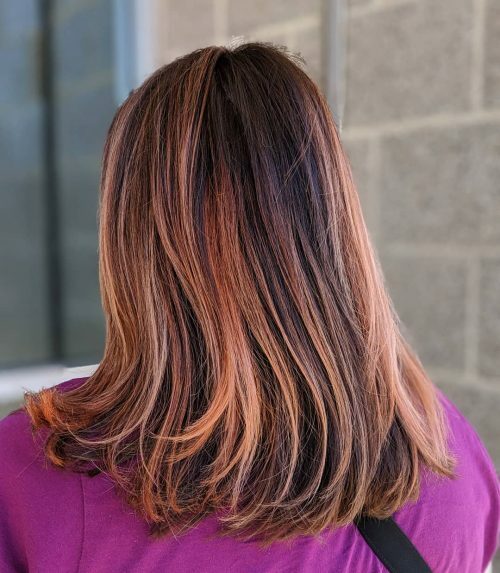 The base color is the client’s natural color (brown-black, around a level 3). Highlights are done with Schwarzkopf’s L series (L-89). It’s styled with a flat iron, loose wave. 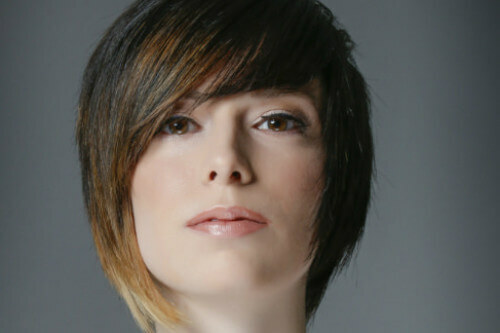 This haircut is ideal for clients with natural texture. Wash and go with a bit of texture spray and you’re good to go! It’s great for low maintenance lifestyles. The color does fade, so a sulfate-free, paraben-free, color preserving shampoo is highly recommended. 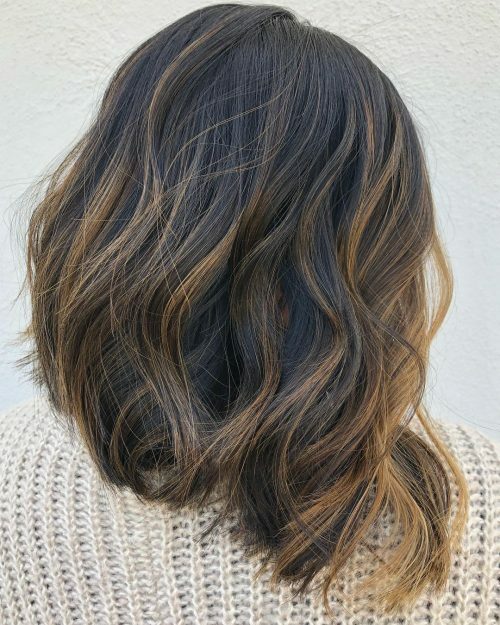 This look is a lived-in balayage. The loveliest thing about the look is how the rich browns complement her natural hair color. The waves help to showcase the dimensional colors and allow for an aesthetically pleasing appearance. 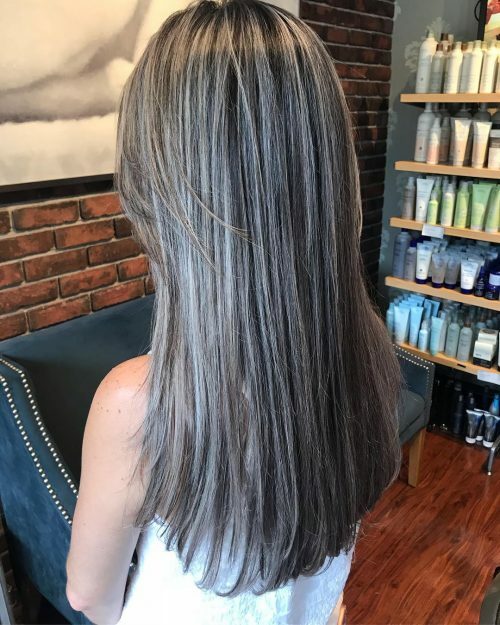 This look is for someone who wants a low maintenance color, only having to maintain it a few times a year versus every 6-8 weeks with traditional highlights. 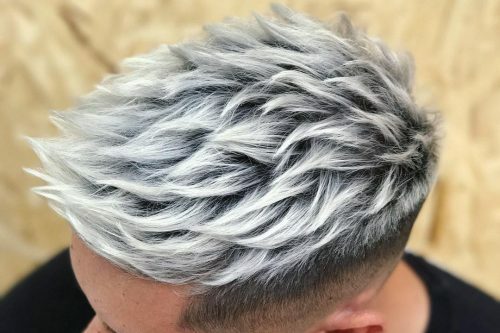 The waves are a simple way to dress up the hair. I used a 1.25-inch curling iron to curl the hair, let it sit until cool, and then brushed them out with my fingers to create the waves. 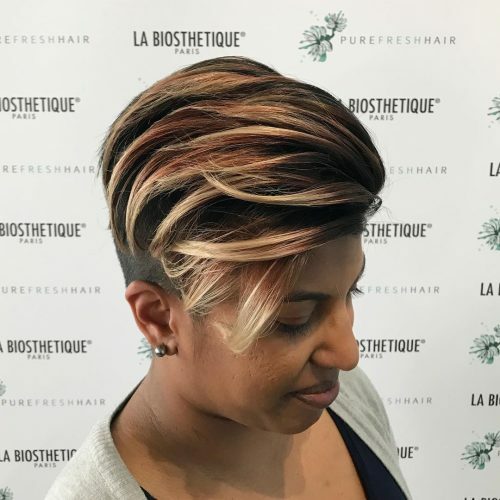 This look is a copper foilayage with a textured bob. The best thing about it is the pops of color being able to not have to get it touched up every 6-8 weeks. This look was achievable on black box died hair, knowing that blonde highlights were most likely not going to happen on the first visit, while keeping the integrity of the hair. It’s also a look that’s low maintenance just like any balayage while already creating that rooted look. The cut is great for her natural texture which is on the straighter side, so if she doesn’t have time to style it, the cut still looks stylish and modern with a tousled look. 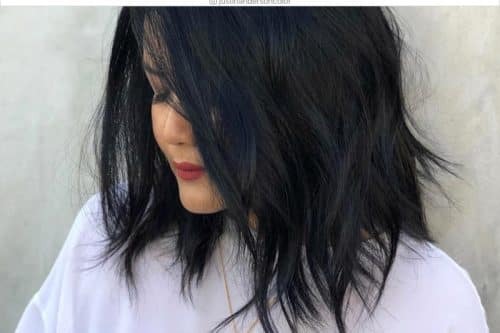 I love this look on dark hair because of how the blue reflects in the light. In some lighting, it looks subtle, but when it’s in brighter lighting, it really pops! Because the highlights were balayaged, when you curl the hair, it looks like blue ribbons. 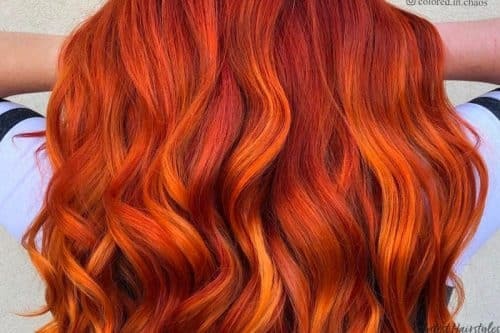 It’s great for darker hair. If you are a lighter brown or blonde, you may want to be careful as the blue may also stain your natural color. This guest here is a makeup artist and loves switching up her fun colors. 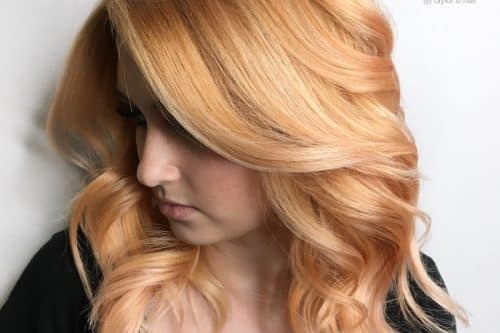 To maintain this color, a color-safe shampoo is important. I love Aveda Color Conserve. The great thing too about this color is I made a custom take-home conditioner to maintain the brightness of the blue. 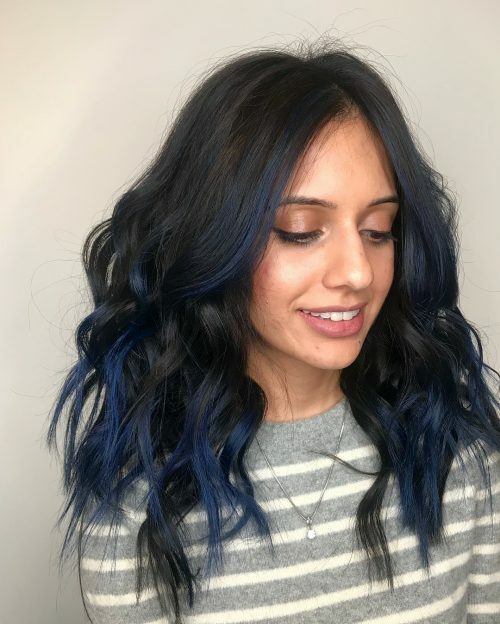 She also would come in every 4-6 weeks to retone the blue. I feel like this is the perfect lived-in, no fuss color and style. The color highlights on top of her already gorgeous natural color. The best thing about this look is that you can either get it all freshened up every 8 weeks (which my client does) or go months and months and it all grows out beautifully. I would try this look out if you have medium-thick hair. This client has thick hair. She is able to still throw it up when she needs to or style it when she can. Always use some sort of heat protectant when using any heat on your hair! This is a very low maintenance balayage highlights on a virgin dark brown base. The tone I gave her is a mixture from Goldwell Colorance, and I call it dark brown with raspberry highlights. The haircut is blunt edgy, very in this winter. This is a very modern look!